Killing them Softly Blu-ray Review Mob movies aren’t everyone’s cup of tea, but for those who love them, Killing Them Softly doesn’t disappoint. Mob films come with an air of high expectation, which is why when a film like Killing Them Softly comes along you are anticipating something special. Luckily, it does deliver. Three generally inexperienced thieves hit a Mafia protected poker game stealing from all the participants and taking the game money, which results in the collapse of local criminal economy. This is set against the backdrop of the United States at the time of onset of the financial crisis and the election race between Barrack Obama and John McCain. The mob employs hit man, Jackie Cogan (Brad Pitt) to take out these three and restore order into the criminal community. Killing Them Softly is a brilliant piece of work. It is one of those wonderful films that combines the notion of film as entertainment and also as an art form. The film is thrilling and action-packed. It is very graphic in parts, particularly when Mickey (Ray Liotta) is undergoing his interrogation of sorts. The script is very well worded and although you have an idea where the film is going, you are still intrigued and it captures your attention right till the very end. The cinematography is very interesting. There are many different techniques used throughout the film. Some of the highlights are when Russell (Ben Mendelsohn) is drifting in and out of his drug induced state while Frankie (Scoot McNairy) is talking to him. The fade in and out is employed at the same time as the depiction of the shot being blurred around the edges makes you feel as though you are really in Russell’s head and have had a bit of the loopy stuff yourself. Also the slow motion of Jackie Cogan’s bullet shattering the car’s window in slow motion is as beautiful as such a situation can be. The soundtrack has been perfectly chosen with each background song enhancing the emotion of the scene which it is accompanying. In Killing Me Softly, there are some good performances by the cast. James Gandolfini gives the stand who love them, this isn’t one to disappoint out performance of the movie. His monologues are said with a complete embodiment of his character and of the emotion accompanying what he is saying. He draws you in and you hang on his every word. Ben Mendelsohn is quite funny and he’s very good as the no-hoper criminal. Unfortunately, there is no special features on this Blu-Ray which is quite a shame really. With so many intriguing decisions made in regards to the cinematography and soundtrack, it would have been great to hear from director, Andrew Dominik as to how these decisions were made. 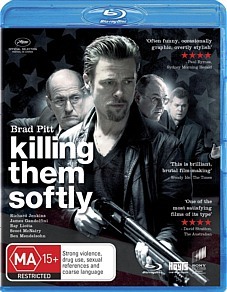 Mob movies aren’t everyone’s cup of tea, but for those who love them, Killing Them Softly doesn’t disappoint.